When you move overseas, no matter where you go, food and shelter are the first things you’ve got to arrange. And when those things are looked after, you ask yourself: “Now, what is there to do?” That’s when entertainment comes to mind. Let me tell you a bit about nightlife in Dominical, my little corner of Costa Rica, down here in the Southern Zone of the country’s Pacific coast. Note…it never involves any shuffleboard. A great place to start your night out is the newest addition to nightlife in Dominical, called Fuego. It’s a beautiful treehouse brew pub just off the beach, which serves a variety of in-house beers and ales, along with a bar food menu. There’s live music there on Wednesdays and weekends…and sometimes, I’m one of the musicians. The crowd is a mix of expats, tourists, and surfers, all slurping tall frosty brews, which range from $4 to $6 (or less during sunset happy hour). Or, for $11, you can try six 4-ounce samples from the extensive beer list. If you’re hungry, appetizers such as grilled shrimp tacos or ceviche go for about $7, and entrées—including tuna tataki, or the fresh catch of the day (usually mahi-mahi or red snapper)—are around $20. Just south of Dominical, you’ll find another great bar, called Roca Verde. It’s the best place on the beach to get a great pizza in the $10 to $15 range, and with icy cold beers about $2, it’s a spacious place where you can dance, have a few libations, and whoop it up. Roca Verde is the stronghold of the local over-50 expat gang, who gather to gossip and enjoy live music on Thursday and Friday nights. They are always welcoming to newcomers and tourists who bring news from “Up North”. 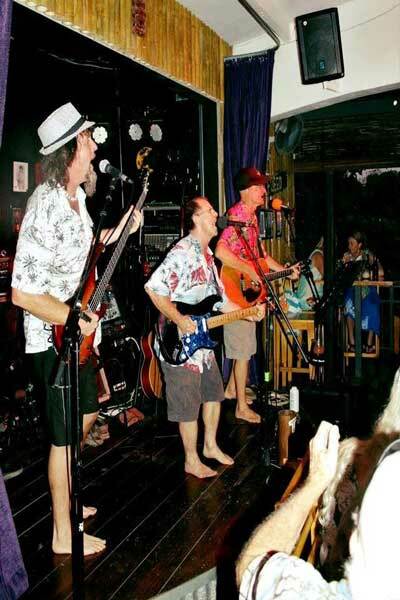 The G-String Cowboys—regular performers at Roca Verde. The featured band is The G-String Cowboys. The Cowboys are three wildly divergent characters: A Midwesterner, a Massachusetts Yankee, and a tall Canadian. A country blues band, they mostly play leader Ken Nickell’s original songs (Ken is the Midwesterner). He is a former Nashville songwriter, and his hilarious, sometimes poignant, lyrics and colorful asides between songs (“Here’s a song I wrote for my first ex-wife…”) guarantee an entertaining evening. If you want to eat at Roca Verde, but pizza’s not for you, other dinner items are available in the $14 to $20 range. The tuna, red snapper and mahi-mahi are all fresh caught daily, because just off the beach out front is some of the best sport fishing in the world. Fish caught there are cooked by Roca Verde people who know their business…and the dishes are as good as you’ll find on a menu anywhere. 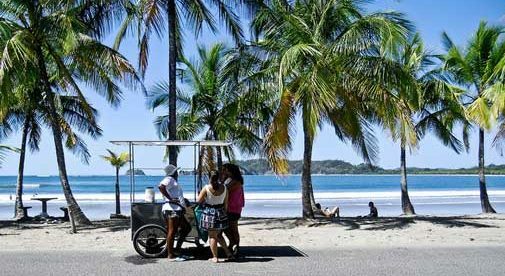 Now, there are lots of places in Costa Rica where you can live a North American gringo life fairly easily. But people don’t move to the Southern Zone because they want a sophisticated, big city lifestyle. Nope. It’s more of a jungle down here…but one with amazing wildlife, beautiful vistas, and waterfalls. Dominical is where you go when you aren’t quite ready to hit the easy chair and pick up a remote. But if you have a little Parrothead in you, surfer towns are always fun places, filled with people looking for adventure, and Domi (as we call it) is no exception. If you think you might like a little Wild West with palm trees and long empty beaches to wander, this could be the place for you.